We've seen still photos shot in the round, but wouldn't it be nice to snag some panoramic moving pictures every once in a while too? 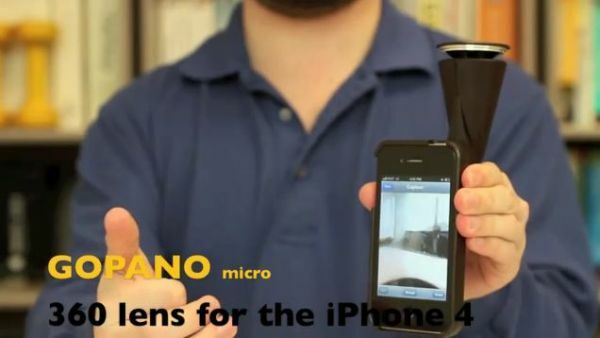 Well, the folks at EyeSee360 certainly think so, which is why they've given the iPhone 4 some 360-degree video recording capability with the GoPano Micro. Comprised of a plastic case for your handset, a detachable 360-degree lens, and a GoPano app, the system lets iPhone fanboys do a circular pan with the swipe of a finger. That put you in the moviemaking mood? Well, you can't get your hands on one just yet, but the venture has already reached its $20,000 funding goal, so those willing to invest $50 can head over to Kickstarter to reserve one of the first GoPano Micros off the production line. Before plunking down your hard-earned cash, however, check out all the full-circumference cinematic fun after the break.